« Who Says Fair Play? 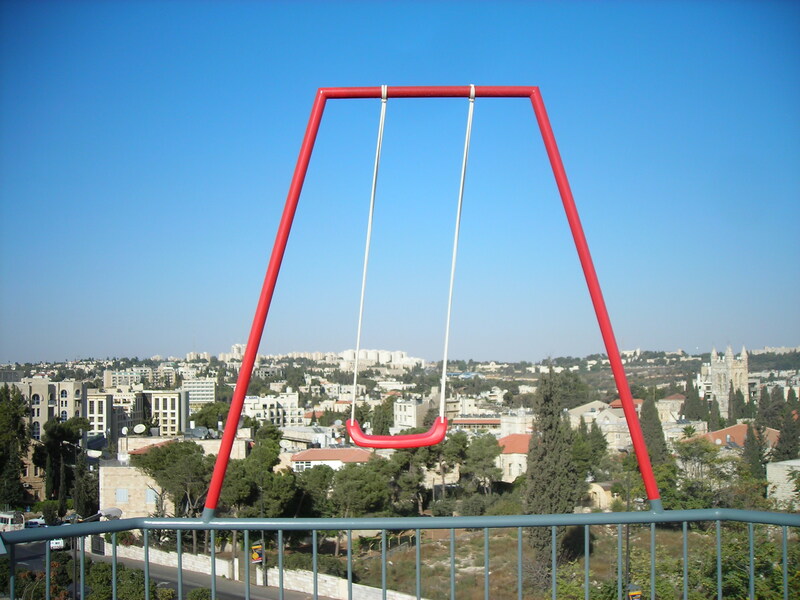 One of my favourite images, that I often show when talking about ‘art of play in zones of conflict’ is Carsten Holler’s ‘Hard Hard to be a Baby’ Which I photographed on the rooftop of the Museum on the Seam in Jerusalem several years ago. It swings in the air right above ‘seam line’ which slices through the city. The swing literally ‘plays’ and mocks the binaries we grew up on (and the Museum still relates to) of East and West, Religious and Secular, Them and Us. I guess I like the swing because it reminds me of my childhood in the city, on which I have written before in Play I Saw Today as well as in Seven Walks in Holy City. The image often provokes questions from viewers, who comment on the danger aspect of the work with its obvious links to the ‘dangerousity’ of the city itself. Danger was part of our childhood, no doubt, more feral and wild than would be allowed today, certainly on the Jewish side. The city we grew up in had horizons that expanded almost literally over night (during the six days war) -the same horizons now filled with settlements, walls and barriers. And these days the city is dangerous only for Palestinian children, who get arrested daily and whose childhoods are very different to the ones enjoyed by those playing only streets away. “Most are ripped from their beds in the middle of the night. Others are taken while playing in the street, or leaving school. Many are blindfolded and shackled on their way to interrogation, which lasts for several hours at a time, all without a lawyer or family member present. Many are beaten, verbally abused, and pressured to sign confessions for crimes they didn’t commit…” – Read full report here. And the expression in the title, which has always intrigued me as a non native english speaker- means – that what you gain on the swings, you will lose on the roundabouts. And what that says about the Israeli state’s constant abuse of children has very little to do with swings but alot to do with roundabouts.